(L-R) Mr. Ezekiel Ibrahim, National President Poultry Association of Nigeria (PAN), Mr. Drees Beekman, Snr. Vice President, Benelux Middle East Africa (BenAFME), Barr. Kazeem Oyewole Oyewumi, Hon. Commissioner for Agriculture, Natural Resources and Rural Development, Oyo state, Mr. Matin Middernacht, Managing Director, Chi Farms Ltd and Mr. Gabriel Varga, Regional Director, Zoetis, Sub-Sahara Africa at the unveiling of City Laboratory in Ibadan, Oyo state. CHI Farms and Zoetis have been commended for the establishment of an ultra-modern veterinary diagnostic centre called City Laboratory, which was commissioned on Wednesday, September 12, 2018 in Ibadan, Oyo State. Minister of Agriculture and Rural Development, Mr Audu Ogbeh, disclosed that the commissioning of the diagnostic centre justifies the collaborative efforts of federal government and the private sector in providing essential tools needed for sustainable socio-economic growth in livestock development in Nigeria. Mr Ogbeh, who spoke through the Director and Chief Veterinary Officer, Department of Veterinary and Pest Control Services, Federal Ministry of Agriculture and Rural Development, Dr Olaniran Alabi, said further that the livestock sub-sector contributes 5.8 percent of nation’s Gross Domestic Product (GDP) and provides livelihoods to over 30 percent of the Nigerian rural population. He added that for livestock business in Nigeria to remain profitable and sustainable in the face of growing population and demand for protein, it was important that animal diseases and epidemics were well controlled and eradicated. The Minister pointed out that the sub-sector was limited by a number of factors most important of which is the preponderance of a wide range of animal diseases such as Contagious Bovine Pleuropneumonia (CBPP), Peste des Petits Ruminant (PPR), African Swine Fever (ASF), etc. For Nigeria to ensure a profitable livestock business for farmers, proper, efficient and accurate animal disease diagnosis need to be carried out, he said. “It is important to note that animal disease diagnosis is an important component of veterinary services and that Nigeria has quite a number of laboratories that carry out animal disease diagnosis. However, these laboratories operate below their optimal level thereby leading to huge gap in veterinary diagnosis services. “The establishment and equipping of Chi Farms’ ultra-modern veterinary diagnostic laboratory being commissioned today in Ibadan could not have come at a better time than now that Nigeria is looking forward to diversification of its economy through agricultural and other non-oil sectors. 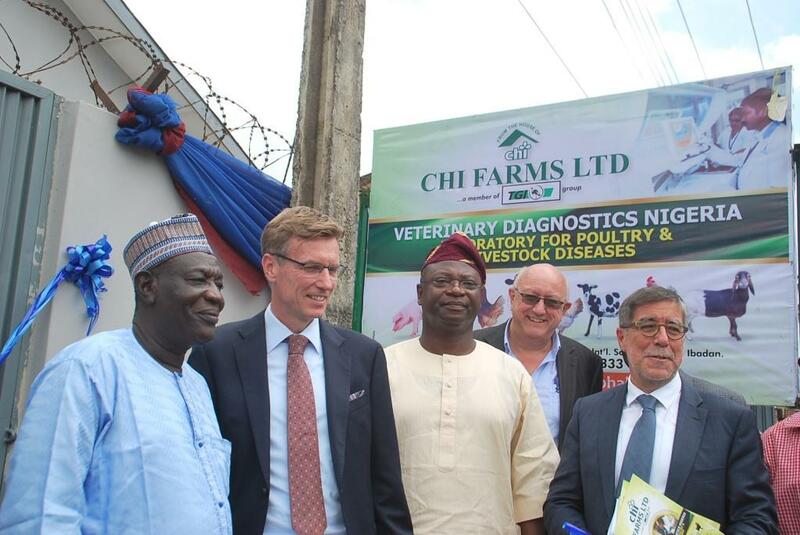 “Let me use this opportunity to appreciate Chi Farms and Zoetis-ALPHA for this laudable initiative and call on other foreign organizations to partner with Nigeria on animal health and veterinary services,” Mr Ogbeh said. Also speaking at the event, National President of Poultry Association of Nigeria (PAN), Mr Ezekiel Ibrahim, said the poultry industry in Nigeria has been confronted with many challenges especially losses as a result of diseases outbreak, which according to him has frustrated and crippled some farmers’ investments, leaving them dejected and hopeless. According to him, “Managing poultry disease is highly sensitive to the time the index case is identified in order to avoid, control and prevent production losses. “The poultry industry at this time requires availability, reliability, accessibility and affordability of diagnostic services for growth,” he added. The association chief also commended CHI Farms and Zoetis for the precise intervention through the establishment of City Laboratory while adding that, the project has come at the right time to support the growth of the poultry industry and redirect the attention of the sub-sector to the importance of quality laboratory service in disease control. In his opening remark, Managing Director of Chi Farms Limited, Mr Martin Middernacht, said the motive behind the establishment of City Laboratory in partnership with Zoetis is to assist livestock farmers raise healthy and profitable animals as well as conduct research and come up with vaccines based on tests conducted. Also, the Regional Director Zoetis, Sub-Sahara Africa, Mr Gabriel Varga, stated that the partnership of his organization with Chi Farms Limited on the project is basically to assist poultry farmers in Nigeria realize their full potential. Mr Varga further stated that similar laboratories will be opened in different parts of the country in subsequent phases of the A.L.P.H.A project.